In today's weekly refresh of the App Store, Apple posted a list called "Best of 2012", highlighting the apps they "loved the most" this year. Day One, a journaling apps we reviewed on MacStories several times, wins as "Mac App of the Year"; "Deus Ex: Human Revolution" wins as "Game of the Year". The Mac section is also viewable on the web here. On the iOS side, Paper for iPad and Action Movie FX win as Apps of the Year; Rayman Jungle Run and The Room win as Games of the Year for iPhone and iPad, respectively. Over the past year, the Mac App Store was packed with impressive new apps and games. Some were dazzling debuts, while others were existing apps updated to leverage new features in OS X Mountain Lion or to take advantage of the Retina display of the new MacBook Pro. Browse the apps and games we loved most in 2012. The list is organized in Runners-Up, Best Apps of 2012, and Best Games of 2012. Below, the full list, recompiled from the Mac App Store, iPhone App Store, and iPad App Store. My personal congratulations to the Day One team, an app that has completely changed the way I archive my memories on iOS and OS X.
Apple has just posted their Q4 2012 financial results for the quarter that ended on September 29, 2012. The company posted revenue of $36 billion ($8.67 per diluted share), with 14 million iPads, 26.9 million iPhones and million 4.9 Macs sold. Apple sold 5.3 million iPods. The company reported quarterly net profit of $8.2 billion. Gross margin was 40.0 percent compared to 40.3 percent in the year-ago quarter. International sales accounted for 60 percent of the quarter’s revenue. In this quarter, Apple’s Board of Directors has declared a cash dividend of $2.65 per share of the Company’s common stock. The dividend is payable on November 15, 2012, to shareholders of record as of the close of business on November 12, 2012. We’re very proud to end a fantastic fiscal year with record September quarter results,” said Tim Cook, Apple’s CEO. “We’re entering this holiday season with the best iPhone, iPad, Mac and iPod products ever, and we remain very confident in our new product pipeline. We’re pleased to have generated over $41 billion in net income and over $50 billion in operating cash flow in fiscal 2012,” said Peter Oppenheimer, Apple’s CFO. “Looking ahead to the first fiscal quarter of 2013, we expect revenue of about $52 billion and diluted earnings per share of about $11.75. For Q4 2012, Apple had set its guidance at revenue of about $34 billion and diluted earnings per share of about $7.65. The Street consensus’ average estimate was earnings of $8.75 per share and revenue of $35.80 billion. On October 24, 2012, both independent and “pro” analysts polled by Fortune (68 in total) forecasted earnings and revenue higher than Apple’s guidance, as it often happens. After getting clobbered quarter after quarter for nearly four years by a bunch of bloggers, day traders and other amateur analysts, the professionals seem to be giving their clients more realistic numbers. And having badly misjudged two of the last four quarters, the more bullish independents have, for the most part, started to come back to earth. In Fortune’s poll, the “pros” averaged earnings per share of $8.82 on sales of $36.02 billion; the independent analysts forecasted earnings of $10.14 on sales of $38.8 billion. Horace Dediu of Asymco also published his forecast for Apple’s fourth fiscal quarter on September 20, 10 days before the quarter (and fiscal year) ended. As he notes, it’ll be difficult to predict iPhone sales for the quarter as consumers have been probably holding off their purchase due to rumors of a product refresh. Furthermore, the iPhone 5 has only been on sale during the quarter for 8 days: the device went on sale in 9 countries on September 21, and 22 more on September 28. Apple only stated that iPhone 5 sales topped over 5 million units during the opening weekend. The iPhone is going to be extremely difficult to project. On one hand we have the launch of the i5 which will account for about 10 million units in the quarter, on the other, chances are that sales were very weak prior to the launch as purchases were being deferred even more than during the last quarter. A better picture of iPhone 5 sales, as well as those from the iPad mini, iPad 4, and recently-updated Macs, will be offered by Apple’s current holiday quarter – Q1 2013. In the previous quarter, Q3 2012, Apple posted revenue of $35 billion, with 17 million iPads, 26 million iPhones and 4 million Macs sold. iPhone represented a 28 percent unit growth over the year-ago quarter, while iPad reported a 84 percent unit increase over the year-ago quarter. Apple sold 6.8 million iPods, a 10 percent unit decline from the year-ago quarter. The company posted quarterly net profit of $8.8 billion, or $9.32 per diluted share. International sales accounted for 62 percent of the quarter’s revenue. In the year-ago-quarter, Q4 2011, Apple posted record-breaking revenue of $28.27 billion, with 11.12 million iPads, 17.07 million iPhones and 4.89 million Macs sold. According to multiple websites that have posted the rumor today, Apple's next generation iPhone will be unveiled at a media event on September 12th, 2012. iMore was first to report on the rumored date, claiming that Apple will announce a new iPhone and a smaller iPad at the event. iMore has learned that Apple is planning to debut the new iPhone at a special event on Wednesday, September 12, 2012, with the release date to follow 9 days later on Friday, September 21. This information comes from sources who have proven accurate in the past. The iPad mini will be announced at the same September 12 event, as will the new iPod nano. IMore was first to report that the company has scheduled a special event for Wednesday, September 12, and now we’ve confirmed it as well. Sources tell AllThingsD that Apple is currently planning an event for that week. The rumor cycle this time around for the next iPhone has been a bit unusual — multiple leaks have all depicted the exact same components — but it looks like we'll be seeing what Apple has up its sleeves come Wednesday, September 12th. Our own sources familiar with the matter have confirmed that date, and multiple websites have similar reports as well. And last, always-reliable Jim Dalrymple at The Loop weighed in with his "Yep" on the rumor. Both Dalrymple and iMore have been accurate with their predictions and "confirmations of rumors" in the past. iMore correctly predicted the new iPad launch date earlier this year, and the iPhone 4S pre-order date last year. AllThingsD also successfully predicted a number of Apple-related rumors in the past, including one about the January 2012 education event. The new iPhone is rumored to feature LTE, a bigger display, and a design similar to the 4S. According to recent speculation, the smaller iPad will feature a 7.85-inch screen with the same resolution of older-gen iPads. Last night, Apple updated its Investor Relations webpage to include a placeholder for the company's next earnings call, scheduled for April 24. 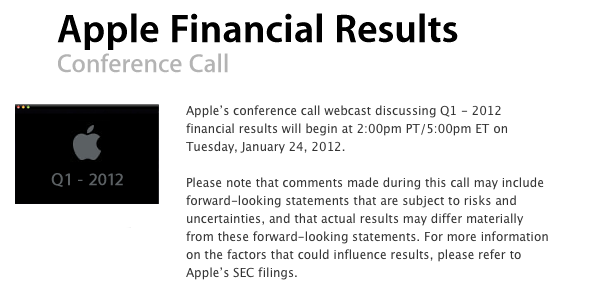 As usual with Apple's conference calls, the event will be provided as an audio webcast for investors and listeners. Apple plans to conduct a conference call to discuss financial results of its second fiscal quarter on Tuesday, April 24, 2012 at 2:00 p.m. PT. Ended on March 31, Apple's second quarter of the fiscal year typically brings in lower sales and volume for the company, although this year's Q2 may signal a change in this tradition with AAPL soaring to new heights every week, and the new iPad selling very well in a larger number of countries than the iPad 2 last year. In fact, whilst Apple didn't provide any official numbers for the iPad 2's release last year, it is safe to assume this year's debut of the new iPad saw larger sales thanks to a wider rollout on Day One (10 countries on March 16, as opposed to only 1 launch country for the iPad 2), rapid follow-up in more countries a week later (25 countries on March 23) and previously reported initial sales figures (3 million iPads were sold in 4 days, prior to the second worldwide March 23 rollout). 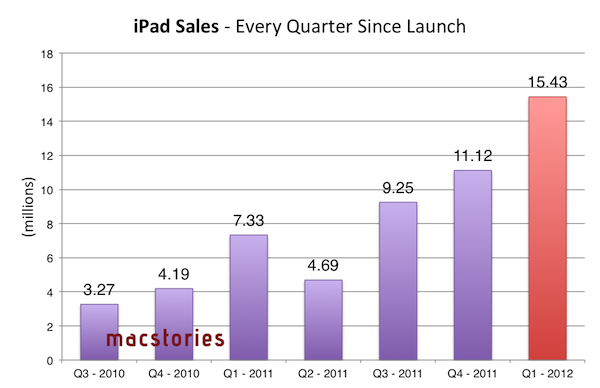 Sales from the March 16 and March 23 iPad launches will be included in this year's Q2 results. 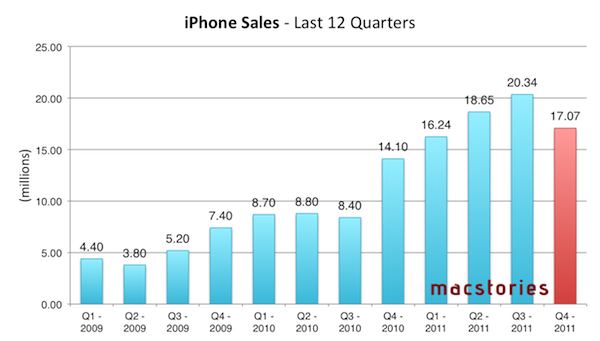 Apple's previous quarter, Q1 2012, has been the company's biggest to date. The company posted record-breaking revenue of $46.33 billion, with 15.43 million iPads, 37.04 million iPhones and 5.2 million Macs sold. Apple sold 15.4 million iPods, a 21 percent unit decline from the year-ago quarter. The company posted quarterly net profit of $13.06 billion, or $13.87 per diluted share. iPhone represented a 128 percent unit growth over the year-ago quarter, while iPad reported a 111 percent unit increase over the year-ago quarter. 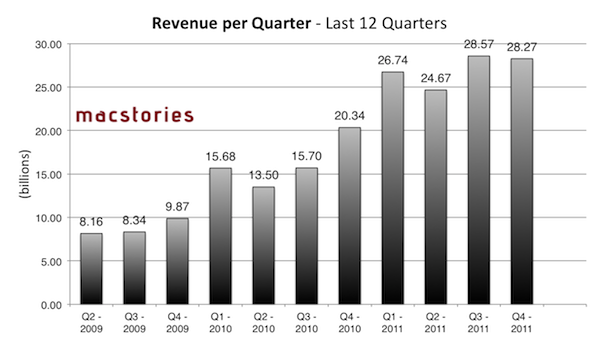 Until Q1 2012, Apple’s most profitable quarter had been Q3 2011 with $28.57 billion revenue. In Q1 2012, Apple CEO Tim Cook remarked how the company was seeing China as "an extremely important market", with "staggering demand" for iPhone. Cook also revealed that, in spite of the "bold bet" they took in terms of iPhone supply, Apple was short of iPhone supply throughout the quarter; the situation had improved by the time of the earnings call, but the company was still short in some areas. In the conference call, Cook also referred to iCloud as the company's "big insight" for the next decade. 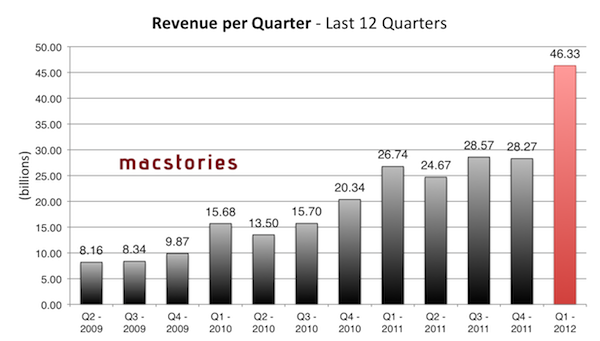 For Q2 2012, Apple set its guidance at $32.5 billion revenue and diluted earnings per share of about $8.50. As Apple's own estimates are generally low, it is no surprise to see analysts projecting bigger sales and revenue, but as noted by Philip Elmer-DeWitt at Fortune, this quarter's estimates show a great difference between estimates from the "pros" (Wall Street analysts) and the "indies". With a $6.8 billion gap, Wall Street analysts expect the company to report $35.88 billion revenue, while the indies forecast revenue of $42.68 billion. While more bullish, estimates from the independent analysts tend to be more accurate, with only a few notable exceptions in the past (such as when they failed to predict customers were holding out for an iPhone upgrade in October). To put these possible numbers in context, here's a graphical representation of how Apple performed in the past quarters. Apple's recently announced quarterly dividend won't begin until the fourth fiscal quarter of 2012. We will provide live updates from the call on our site’s homepage on April 24 starting at 2 PM PT. For a recap of news and events that may have affected Apple's results in the quarter, check out our January, February, and March In Review sections. The iPhone 4S, released in October, was supposed to feature LTE connectivity, at least according to some of the rumors that were floating around at the time. The device turned out to feature faster 3G downloads at 14.4 Mbps through HSPDA, which is an enhanced version of the 3G protocol that has been around for a while, but still isn't as widely adopted as you would expect from a technology that Apple decided to use in a major iPhone upgrade. In Italy, for instance, few areas have access to HSDPA, not to mention HSPA+. Now, the debate as to whether Apple should have made the 4S an LTE iPhone or should have an LTE iPhone 5 this year is making the rounds again. Unlike previous debates, fortunately this time we have someone who's trying to make some sense out of this and cut through the haze of rumors and theories to point out that, actually, it wouldn't make much sense business-wise for Apple to implement LTE in the near term. Why? Because of all those 37 million iPhones Apple has sold in the quarter that ended on December 31, very few of them were sold in areas where LTE is available. Read: the United States, some parts of Denmark and Sweden, some cities in Canada, and Saudi Arabia. The "4G" rollout in countries other than the US is a slow process, and the ones mentioned above have a very small percentage of their spectrum covered by active LTE networks -- they're basically in the middle of initial testing right now. And even in the US, Chris Foreman assumes that whilst the major carriers have all implemented LTE or will start relatively soon, only half of subscribers would be covered in 2012, thus reducing the potential addressable market to 15% of iPhone customers worldwide. Why would Apple make an LTE iPhone for 15% of its entire customer base? According to fourth quarter 2011 results, AT&T activated 4.1 million iPhones, while Verizon activated 4.2 million. Sprint would not disclose the number of iPhones it activated last quarter, but we feel safe in assuming that number is less than 4 million. Assuming Sprint was able to activate (perhaps a generous) 2 million or so iPhones, only a little over a quarter of iPhones were sold in the US. The other three-quarters, then, are sold in areas with practically no LTE coverage. It goes deeper. You might argue that, yes, Apple could make an exception because they have made some in the past. But the WiFi-less 3GS and camera-less iPhone 4S were necessary modifications to get these devices on sale, otherwise they wouldn't have gotten regulatory approval. It's not like Apple is forced to implement LTE, especially considering the enhanced 3G still isn't as widely adopted as the company hopes. 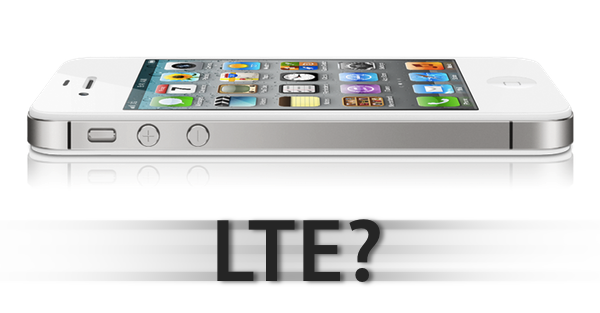 The LTE iPhone is primarily the result of months of speculation and countless rumors based on nothing. No evidence. Perhaps a few code strings here and there, but then again -- go trust those code references these days. For all we know, the LTE iPhone doesn't exist. Or does it? A popular counterargument I often get is that Apple experiments with all kinds of new technologies in their labs; they take a look at new specifications and standards, and consider whether they should be worth investing more research and development resources for possible future implementations. I get it, and it's entirely plausible that Apple engineers have at least looked at current LTE chips utilized by several Android handsets. But I don't know how far they may have gotten into actually testing these chips, if only for verification purposes, at the light of Cook's multiple remarks in the past about concerns regarding the effects these chips have on battery life. Those bigger screens Android makers tout in their commercials might be a requirement, rather than a feature. But I digress. A few hours ago Apple released its Q1 2012 financial results and it saw Apple post its biggest quarter ever with revenue of $46.33 billion and see record sales of its Mac, iPhone and iPad product lines. We covered all the results in our Q1 2012 Results article earlier today so be sure to head over there if you haven't already - it also includes a number of graphs that demonstrates Apple's performance over the past 12 quarters and it paints a fascinating picture. However, the earnings call itself is an interesting one hour, with Tim Cook (CEO) and Peter Oppenheimer (CFO) also answering a number of questions from select investors and analysts. In this Q&A section, a number of details are revealed - including additional statistics. We've re-listened to the call and have compiled the following post that highlights the more interesting aspects of this Q&A section and it is all below the break. Apple has just posted their Q1 2012 financial results. The company posted record-breaking revenue of $46.33 billion, with 15.43 million iPads, 37.04 million iPhones and 5.2 million Macs sold. Apple sold 15.4 million iPods, a 21 percent unit decline from the year-ago quarter. The company posted quarterly net profit of $13.06 billion, or $13.87 per diluted share. iPhone represented a 128 percent unit growth over the year-ago quarter, while iPad reported a 111 percent unit increase over the year-ago quarter. “We are very happy to have generated over $17.5 billion in cash flow from operations during the December quarter,” said Peter Oppenheimer, Apple’s CFO. “Looking ahead to the second fiscal quarter of 2012, which will span 13 weeks, we expect revenue of about $32.5 billion and we expect diluted earnings per share of about $8.50. This is Apple's best quarter ever. Until today, Apple’s most profitable quarter had been Q3 2011 with $28.57 billion revenue. Wall Street consensus’ estimate was earnings of $10.08 per share and revenue of $38.85 billion; six institutional/independent analysts polled by Fortune expected earnings per share of $11.57 and $41.87 billion revenue. In Q4 2011, Apple said they expected revenue of about $37 billion and diluted earnings per share of around $9.30 in the first fiscal quarter of 2012. 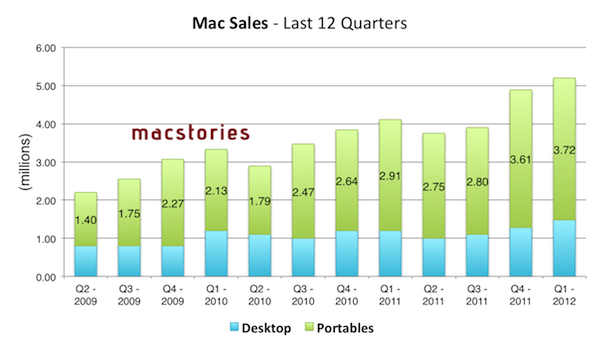 In Q4 2011, Apple posted revenue of $28.27 billion, with 11.12 million iPads, 17.07 million iPhones and 4.89 million Macs sold. The company posted quarterly net profit of $6.62 billion, or $7.05 per diluted share. iPhone represented a 21 percent unit growth over the year-ago quarter; iPod sales were down 27 percent from the year-ago quarter, and Apple reported the best iPad quarter to date with over 11 million units sold and a 166% increase over the year-ago quarter. In the year-go quarter, Apple posted revenue of $26.74 billion with 7.33 million iPads, 16.24 million iPhones and 4.13 million Macs sold. At 2 PM PT, Apple is set to announce its financial results for the quarter that ended on December 24th, 2011. According to several analysts polled in the past weeks and Apple's own guidance for the quarter, Q1 2012 is on track to become Apple's biggest quarter to date both in terms of sales (with expected record iPhone and iPad sales) and revenue. 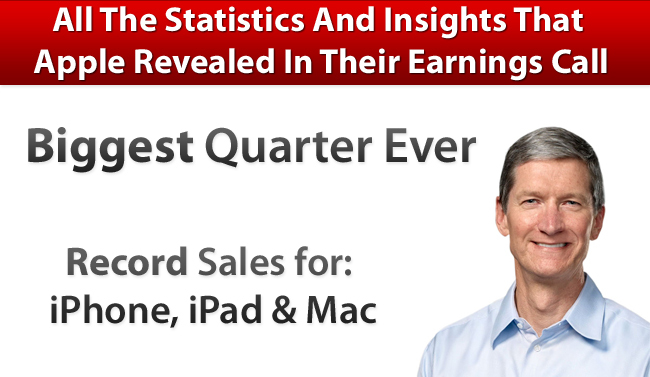 Until today, Apple's most profitable quarter has been Q3 2011 with $28.57 billion revenue. Below, we've compiled a breakdown of Q1 2012 estimates with a recap of what happened during the quarter. During last quarter's earnings call, Apple said they were expecting $37 billion in revenue and diluted earnings per share of around $9.30 for this quarter. As Apple's guidance for future quarters is historically low and conservative, the already high projection of $37 billion led bloggers to speculate Apple's Q1 2012 would be a blowout quarter; some analysts, on the other hand, usually don't pay attention to Apple's guidance as the company lowballs expectations for the upcoming quarter. Analysts and bloggers polled in the past few weeks had different takes on what Apple will report later today. Some of them, such as Robert Paul Leitao, Horace Dediu and Navin Nagrani projected revenue above $44 billion with iPhone sales of 34-35 million units and iPad sales in the range of 13 million units; as we reported three weeks ago, Asymco’s Horace Diedu estimates that Apple will report earnings of $12.3 on revenues of $44.6 billion, with the street price aiming at $9.75 EPS on $37.99 billion. As Philip Elmer-Dewitt also noted, analysts' estimates need to be taken carefully, as several of them were released after the previous quarter's results, and were never updated reflecting changes that took place through the quarter (such as fluctuating iPhone demand and international product launches). Fortune's comprehensive list of estimates for Q1 2012 is available here. As far as iPhone sales are concerned (in Q4 2011, the device accounted for 47% of Apple's revenue), this quarter will see Apple finally providing some actual insight into the iPhone 4S' performance on the market. The device is well-regarded as a success on various international markets and the United States, but the only real numbers Apple posted referred to the opening weekend. Predictions for Q1 2012 go as high as 35 million units sold (those would indicate cumulative sales for iPhone 4, 4S and 3GS, not just the iPhone 4S), with an approximate figure of 30 million units sold being shared the majority of analysts and bloggers. Among recent acquirers, meaning those who said they got a new device within the past three months, 44.5 percent of those surveyed in December said they chose an iPhone, compared to just 25.1 percent in October. Furthermore, 57 percent of new iPhone owners surveyed in December said they got an iPhone 4S. This morning, Verizon Wireless reported 4.2 million iPhone activations. Reuters wrote Verizon's "business was hit by the high costs of sales of advanced phones such as the Apple Inc iPhone." Verizon reports 4.3 million iPhone activations in Q4. (My estimate was 4.2 million).